Each block represents a belief group and shows five percentages. The first is the size of that group; the other four are the estimates those in the group make of the sizes of their own and other groups. Their estimate of their own group is outlined in black. Global Temperature 'anomaly' distinguishing El Niño (red) and La Niña (blue) years where known. Is it Global Warming or Climate Change? Do we need to reduce GHG emissions? What about the ozone hole? In 1975, worldwide temperatures had been falling for 20 years, and the concern was that a new ice age was imminent. Dr. Wallace Broecker of Columbia University, a world authority on climate, dismissed it, publishing a paper titled, "Climate Change: Are We on the Brink of a Pronounced Global Warming?" That appears to be the first use of the term Global Warming, and at that time "Climate Change" was only used more generically. Later, there was a push towards referring to the current problem as "Climate Change" thereby making that a more specific term. This is reported to have come from the fossil fuel lobby, believing it to sound less alarming. But in some ways it is a more accurate term. "GW" gives the impression that everywhere will get a little warmer, which is likely not the case, and fails to draw attention to the most serious consequences. Average temperatures will increase by a few degrees Celsius, but that's a lot less than the annual variations that occur in most places anyway. The local effects of that on climate, though, could be dramatic. Some places will get a lot hotter, some colder, some wetter, some drier, or more or less windy, etc. It may well be beneficial for humans in some regions, such as the far north, but is much more likely to be bad for most people, and to other species that have spent millennia adapting to local conditions. Can such warming be caused by GHGs (greenhouse gases)? Can anthropogenic (emitted by humans) GHGs change the climate significantly? Have they done so over the last century? How bad will it get if we carry on as now? What is a safe level in the atmosphere? But there are several ways to spot trends. As well as direct measurements, we can look at ocean levels and changes in plant distributions and animal behaviours. Naturalists observe a shift in the seasons. 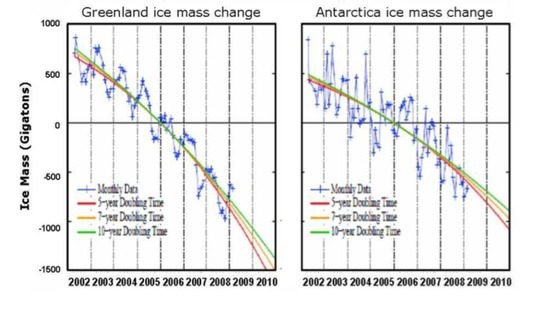 Ocean levels are rising, which means either they're warming up or land ice is melting and flowing into them, or both. There can be no doubt the world has warmed in the past 100 years. Some deniers claim it stopped warming around 2000, but that claim is shot down quite easily. Anyone who persists with this argument is a stranger to reason. Perhaps the strongest evidence for continued global heating is the radiation imbalance. Satellites show there is more energy coming into the Earth from solar radiation than the Earth is radiating back out. That excess energy is being stored somewhere. In 1896 Svante Arrhenius was thinking about ice ages. He calculated that halving the CO2 in the atmosphere would cool Europe some 4-5°C. Since then, fluctuations in CO2 levels over millions of years have been linked to temperature changes. 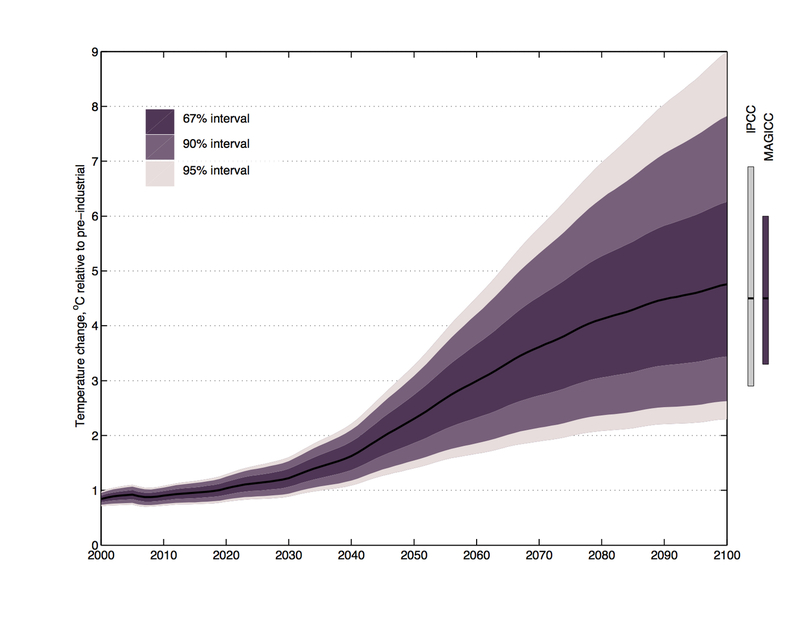 Can anthropogenic GHGs warm the planet significantly? Arvid Högbom then calculated that if we were to burn all the fossil fuel available to us it would produce 10 times the CO2 already in the atmosphere. This definitely had the potential to change the climate, but at the rate at the time it would have taken millennia to burn it all. At the current rate of growth it will take a few hundred years, and climate may be affected much sooner. It is vital to understand that the rate of emissions only affects when it will become a problem, not if. Whether water gushes into a bath or only drips, it will fill it eventually. Every country needs to aspire to being carbon neutral. Have they warmed it significantly over the last century? Note that the question is not whether human emissions are the main cause, only whether they have made a significant contribution. Whatever the main cause, if we can mitigate it by reducing emissions then that's what we should do. Over the years, a vast amount of work has gone into developing models of the climate. These get better all the time. They are assessed by their abilities to "predict" past changes, as known from the geological record, from what is known of the circumstances of those times: atmospheric mix, arrangements of the continents, strength of the sunshine and so forth. None of them are perfect, but increasingly they agree. And most agree that our emissions have been enough to account for the increased GHGs in the atmosphere, and that these in turn are sufficient to have driven the increase. With business as usual, the models predict the temperature will rise several degrees over the next 100 years or so. They indicate that even a 2oC rise is risky. Predicting the climate consequences is much harder. Even small long-term changes in temperature can shift winds and ocean currents, leading to quite different patterns of climate. Warmer polar waters could cause a permanent El Niño. For sea-level rise, the prognosis is clearer. 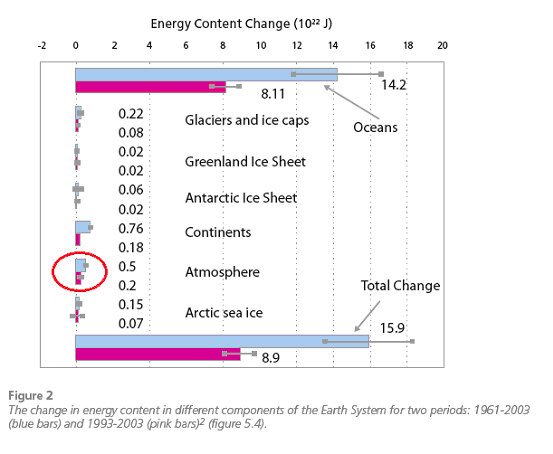 The long-term rise for an extra 1C depends strongly on how much ice is within 1C of melting. Estimates vary from 6m to 20m, but it could take hundreds of years to reach that. At first, the IPCC thought 450-550 ppm was ok, but revised it down to 450ppm. That number seems to have become etched into the minds of many politicians, but meanwhile the scientists have had cause to bring it down to 350ppm. Several propose 300ppm as the completely safe upper limit. The pre-industrial level was about 280, and right now (2010) we're approaching 390. If we're already past the safe limit, why aren't we seeing major disasters right now? Because there's a lot of lag in the system. If you increase the level of GHGs in the atmosphere quickly then keep it the same for a while the Earth gets slowly hotter for decades. We've left matters so late that now we don't only need to become carbon neutral but must actually draw down some. pollution haze is blocking the sun, so temperatures will climb rapidly as the air gets cleaner? Of these, the biggest uncertainties in the science are regarding pollution haze ("aerosols"), so there's no cause for complacency. Another big unknown is how clouds will be affected as the temperature rises further. Oct 2010: 2 deg C "not safe"
Dec 2011: ... or is it 3.1 to 3.9? Does GW threaten humanity's survival? 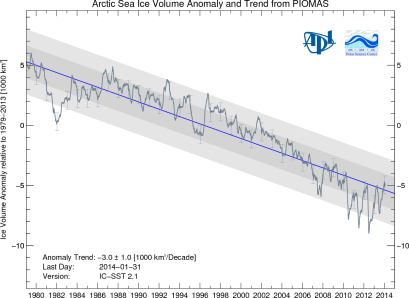 The most worrying aspect may be the effect on ocean circulation. Several major extinctions in the geological record have resulted from prolonged vulcanism pumping vast quantities of CO2 into the atmosphere. The resulting warming is more at the poles than at the equator, reducing the temperature difference. That takes away the driving force behind the deep sea ocean currents. Without those, the deep ocean becomes de-oxygenated. Sulphate-reducing bacteria take over, pumping toxic H2S into the atmosphere. The pace of warming has certainly slowed since around 2000. Has it reached a plateau? How long will the slowdown last? A major reason scientists conclude Global Warming is a reality is the 'radiation imbalance'. Satellites show that more radiant energy is entering the planet than leaving it. In a steady climate, it should be the other way around; heat generated by nuclear fission within the Earth needs to escape too. It's much harder to pin down exactly where the heat is going. There are relatively few measuring stations at the poles, and hardly any before 2000. The deep ocean is an even greater unknown. If vertical mixing is only a little more than currently believed then it would account for a great deal of hidden heat. 1998 was an unusually strong El Niño year. Since then, La Niñas have predominated. As far as is known, this is not a result of GW but of natural variability. In the sun's cycle of activity, the current quiet phase has been longer than usual. The last decade, has been more than usually volcanic. Sulphate aerosols serve to reflect some of the sun's radiation back into space. In each case, the respite is likely to be temporary. Various processes both affect the earth's temperature and are affected by it. So when the temperature changes, the chain of events can lead to another change later on. If the second change is in the same direction as the original one, amplifying it, it is called a positive feedback, otherwise it is a negative feedback. Note that a negative feedback cannot usually result in the temperature going down instead of up; it only makes the increase less. Is it positive or negative, and how strong is it? This can be complicated because a feedback can vary in strength, and even direction, according to circumstances. How rapidly does it act? The feedbacks via clouds are a major uncertainty in the science of climate. Depending on the type, timing and location of a cloud, it can warm the earth by acting as a blanket, or cool it by blocking the sun. Negative, very strong, immediate. Though perhaps not usually thought of as a feedback, this is the basic mechanism that keeps the earth at a more-or-less constant temperature day-to-day. The hotter the earth, the more heat is radiated into space. Positive, strong, short term. When the temperature rises, more water evaporates into the atmosphere. It may feel drier because the air is less saturated, but in absolute terms there is more water vapour, and this is a very powerful greenhouse gas. Strong, positive in the medium term. When the temperature rises, CO2 in the atmosphere increases over the following hundreds of years. This is the result of several separate processes, some of which may in themselves be negative. -/+ Plant growth is stronger in temperate zones when warmer, taking up CO2. But too much warming can make it a positive feedback. One model suggests the response of plants to increased CO2 could trim 15% off a 2 degree warming. Oceanic organisms may also flourish. But much longer term there is a strong negative feedback. A hotter earth has more active weather systems, eroding rocks. The exposed rock absorbs CO2, sequestering it. This process takes millions of years, but is thought to be a vital thermostat keeping the earth habitable over billions of years, even though the sun has gradually warmed to be 30% hotter today. Positive, strong, short term. A cover of sea ice reflects the sun's rays back into space, keeping the planet cool. Positive, long term. CO2 dissolves less well in warmer water, so continued ocean warming will lead to less absorption of CO2, perhaps even a reversal. Positive, unknown strength, various timescales. Clathrates are frozen mixtures of methane and water which can lie at the bottom of oceans. Permafrost also retains methane. Warming will melt more of these, releasing the methane into the atmosphere. How much is there and how quickly they will melt is uncertain. There are signs that more mixing is occurring between arctic air and the northern temperate zone. While this produces cold weather in Europe and North America, it warms the arctic, leading to global warming as described above. If this mixing is caused by the warming then it is another positive feedback path. Fresh water from melting glaciers and ice caps alter ocean circulation with potentially dramatic effects on climate. Soot from forest fires and industry darkens snow, cutting albedo and helping it melt. Even if global warming were not an issue, our CO2 emissions are seriously damaging ocean life. Denialists don't usually discuss this because there are far fewer opportunities for sowing doubt. CO2 increases the acidity, making it harder for corals and shellfish to grow, and even dissolving them. Many other factors affect climate, but only GHGs come close to explaining the observed trend. See graphs. Burning fossil fuels results in a much faster movement from the geological deposits into the fast cycle. As the quantity of carbon in the fast cycle increases, that will gradually raise the rate at which carbon is moved back out of the fast cycle, but it will take thousands of years for a new balance to be established. More carbon in the fast cycle will tend to mean more carbon at all stages within it, and that includes the CO2 in the atmosphere. GHGs warm the earth's surface by trapping heat in the lower layers of the atmosphere. That also means the upper layers get colder. Unfortunately, the chemical reactions up in the stratosphere by which CFCs destroy ozone happen faster at colder temperatures, so AGW also expands the ozone hole. 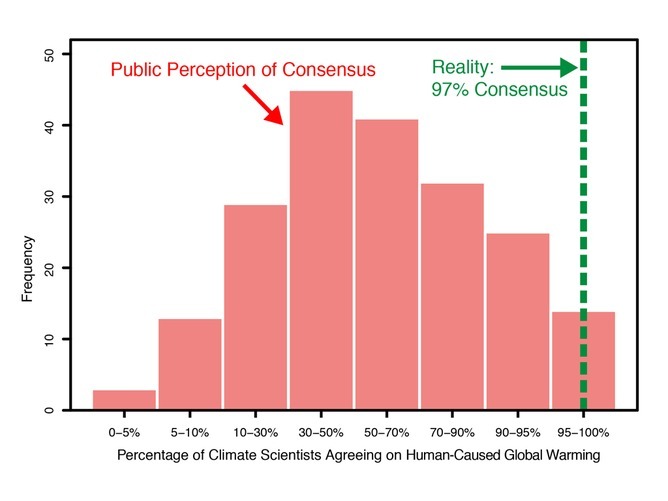 Climate Change deniers prefer to be called sceptics. A sceptic, though, is someone who believes something only when the evidence for it outweighs the evidence against. All scientists worthy of the term are sceptics by definition, and the majority of climate scientists are persuaded of anthropogenic (human-induced) global warming. For most deniers the scepticism is entirely one-sided, not being sceptical for a moment about their own position. Certainly there are some serious scientists who doubt AGW, and these must be given due consideration. It has been noted that they tend to be retired or approaching retirement. Eminent physicist Max Planck observed, "a new scientific truth does not triumph by convincing its opponents and making them see the light, but rather because its opponents eventually die, and a new generation grows up." Or as some have it, "science advances one funeral at a time." Meanwhile, major policy decisions cannot wait for unanimous agreement. Politicians must judge the consensus. This analysis should help: http://www.pnas.org/content/early/2010/06/04/1003187107.abstract. 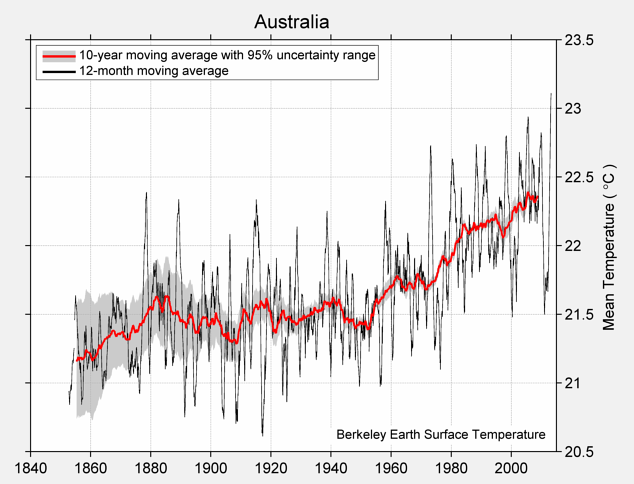 Tim Lambert's blog 'The Australian's War on Science"
Dave Rado on Martin Durkin's film, the Great Global Warming Swindle. Howard Friel on Bjørn Lomborg. Barry Brook on Ian Plimer's "Heaven and Earth"
Jon Doig on Leon Ashby's"Why an ETS is not necessary"
Ove Hoegh-Guldberg on The Australian's deceptions over the threat to the Great Barrier Reef. 1. Will GW shut down the Gulf Stream and cause an Ice Age in Europe? The Gulf Stream is part of the Atlantic Meridional Overturning Circulation (AMOC), an ocean circulation system that carries warm upper waters north and returns cold, deep water south. This process is also known as the North Atlantic thermo-haline circulation. Yes, GW could shut down the Gulf Stream, and yes, that might make temperatures a few degrees cooler in Western Europe than GW would otherwise have made them. But stopping the Gulf Stream will not cause an Ice Age. Most of the winter temperature difference between Eastern seaboard US and Western seaboard Europe is caused by the prevailing winds being West to East. The Atlantic ocean acts as a huge heat buffer, tending to smooth out the year-round temperatures, and the Westerly winds transport this smoothing to Europe. The Gulf Stream helps, but is not the major component. But GW could change the wind patterns in ways that are hard to predict. 2. Is GW responsible for increased earthquakes and volcanoes? First, there have not been more earthquakes and volcanoes than normal in recent years. Secondly, it would be very hard to relate any given such event to global warming. That said, GW could affect seismic activity. Melting of thick ice cover could release magma; conversely, rising sea levels could mean fewer eruptions from coastal volcanoes; changing wind patterns alter the ocean's pressure footprint on the crust, triggering earthquakes and tsunamis. 3. Could GW cause a permanent El Nino or La Nina? Research by the National Oceanography Centre, Southampton, UK, into weather variations during the Cretaceous warm period indicates that these decadal cycles occurred at about the same frequency as today. 4. What are the GHGs? 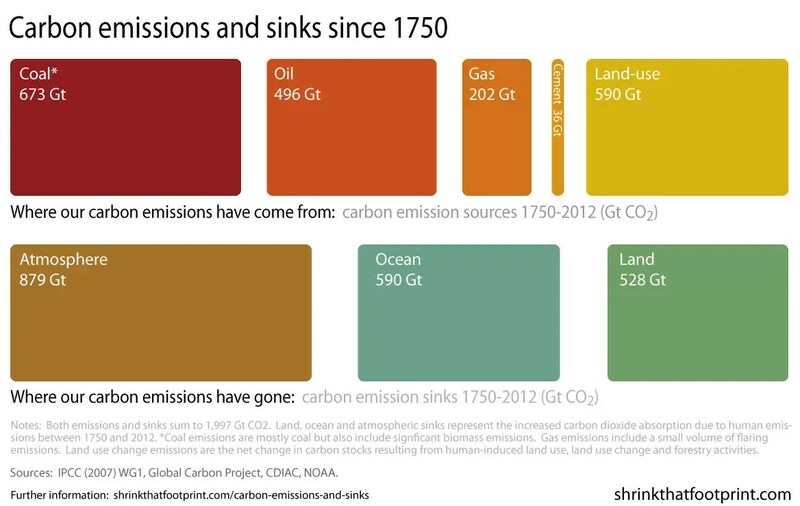 While CO2 is the one most discussed, other emissions can be significant. See the IPCC's GHG list for details. How much each contributes is complex. The relative importance can change over time. It is often stated that methane is a much more potent GHG than CO2. That's not really true. In the context of the emissions spectrum from the Earth, and the presence of large amounts of water vapour but little of other GHGs, CO2 is intrinsically about twice as powerful as methane. But the effect of any given gas declines logarithmically. Each doubling of the gas concentration increases the absorption by the same amount. Although the atmosphere is only about 0.04% CO2, that's far more than for methane. So a small increase in methane level represents a large percentage increase, which means a high GHG potential. For convenience, formulas have been standardised for expressing all such emissions in tCO2e (tonnes of CO2 equivalent). Since methane slowly converts to CO2, the equivalence also depends on the timescale considered. Soot particles ("black carbon") are also important. Many have become intrigued by the phenomenon of climate change denial. Social scientists have found strong correlations between political hue and a general tendency to reject bad news. Their studies could help frame the AGW message more effectively.